Like many of us, screenwriter Todd Farmer and his co-writer/director Patrick Lussier wished that the newest releases being served up by the studio system had more in common with the kind of movies Hollywood used to make. But after screening just five minutes of their contemporary throwback to ‘70s revenge-driven, rubber-burning autoxploitation metal-on-metal, pedal-to-the-metal pictures in the form of their badass behind-the-wheel testosterone litmus test Drive Angry , we realize that their definition of “the kind they used to make” is very different from that of mainstream viewers. And given the finished product, maybe in the future, that should be the “to greenlight or not to greenlight” test for a Hollywood “Go” picture because if it freaks Cage out, it may need a rewrite or at the very least a whole different level of MPAA classification. Longing for the good old days of crash and burn midnight movies where the good guys were so bad that they pushed the “antihero” label to its breaking point and the bad guys were unspeakably evil by exploitative design, Lussier and Farmer revved up their original idea that was fit for McQueen, giving their grindhouse feature a supernatural side. Infusing their Bronson inspired premise of a father hellbent on revenge with the fires of hell, Lussier and Farmer take the figurative idea that prison is hell literally by opening their 3D follow-up to their three-dimensional My Bloody Valentine remake in hell. 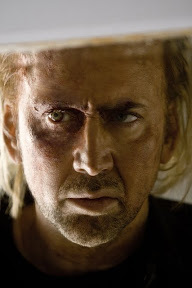 Unwilling to let the fact that he’s imprisoned in hell stop him from embarking on a six-state road-rage fueled race against time, Nicolas Cage’s John Milton brings hell with him in his Earthly escape, desperate to rescue his kidnapped baby granddaughter from the sacrificial clutches of the satanic cult leader (Billy Burke) that took his own baby girl’s life. 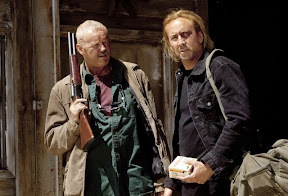 In addition to Cage, Angry boasts a terrific supporting cast including Burke’s terrifying cult leader (modeled on both Jim Jones and Jim Morrison), Amber Heard as Cage’s feisty refreshingly non-love interest/surrogate daughter female sidekick, David Morse, and Angry ’s MVP William Fichtner as its most fascinating character – The Accountant – who balances Hell’s books (and should’ve been used as the center of a much better movie). While at its best, Angry is proof that you don’t need $200 million to make an action movie since its most creative scenes seem to have stemmed from approaching plot points with limited means, unfortunately the flick is most often at its worst. Therefore, all of the effort Cage puts into the film is ultimately wasted in Lussier’s ultra-violently frenzied, mad-dash of a picture. Even in a 2D Blu-ray , you get the sense that 3D was used to distract you with visual razzle dazzle from the catastrophe that turned into the final cut, which in no way, shape or form could’ve been saved in the editing room, even by someone as talented as former Scream Trilogy editor turned director Patrick Lussier. 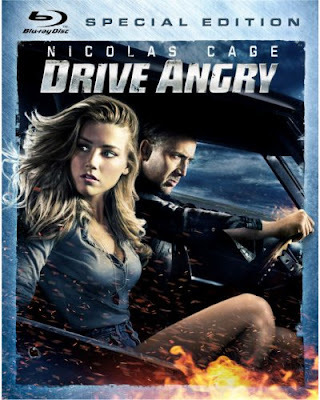 Going so far off its course as a gritty yet goal-oriented man-on-a-mission actioner, Drive Angry takes one too many turns for the worse, becoming as aggressively ugly as it is utterly pointless -- crashing and burning long before the lead’s ’69 Dodge Charger makes its way to the final credit finish line. So when it all comes down to it, I guess they just can’t “make them the way the used to” even if Lussier and Farmer get behind the wheel and give it one hell of a try in a freewheeling fast-paced film determined to thrill us until the wheels fall off, which unfortunately happens in Drive Angry ’s irritable first half. Likewise, had Cage realized that it's OK to "just say no," once in awhile, perhaps the filmmakers would've been inclined to "just say yes," by taking advantage of Cage's cautionary yellow light to give their greenlit script a much needed tune-up, oil-change and rewrite -- souping it up to full throttle perfection before hitting record on the camera's red light.